We attended the Friday 13th meeting with the U.S. Air Force delegation conducting the “scoping meetings” for an Environmental Assessment about using Boise as the site for “close air support” training in an urban setting. An EA is less demanding than an Environmental Impact Statement (EIS), but so many acronyms were floating around the room it sounded like alphabet soup. Many in the audience were full blown environmentalists and frankly seemed to have a better grasp of the process and regulations than those from Mountain Home. In a nutshell the Air Force is planning to fly F-15 fighters over the city while a cadre of 35 airmen on the ground (grounded airmen?) will identify targets such as vehicles and structures for the fighter jets to shoot with “eye-safe lasers.” A typical exercise would have the airmen driving civilian vehicles and wearing civilian clothes. It would last about 90 minutes and the aircraft would “orbit” about 20 times. Air and ground would communicate with portable radios. When we noted that many civilians in Boise WOULD be packing heat, the audience erupted in laughter. However, if a bunch of guys are running around Boise playing war they stand a good chance of having their game interrupted by either the police or concerned armed citizens. We suggest the troops wear easily recognized uniforms and drive official government vehicles. Our city is not the place to play war. We take combat seriously. Overall the audience asked good, probing questions. The Major did well with technical answers, but as a whole the presentation was clumsy with many unanswered questions. An impromptu vote was taken and the citizens overwhelmingly wanted another meeting with better answers regarding if other cities were being used for target practice, how long the training would last (no date for final flight if ever), if foreign forces would be flying here, what recourse Boise folks have if the Air Force exceeds the scope of the training, etc. I was surprised to learn that the Air Force had been doing such close-air support training flights over the area for several years. They stopped three years ago upon discovery that they were not complying with the National Environmental Policy Act. NEPA requires assessment of the environmental impact of such an operation. Surely the Air Force has better public-involvement expertise than was on display this afternoon. The last-minute cancellation of the previously scheduled scoping meeting, the spotty notification about today’s, scheduling it at 4 p.m.–6 p.m. on a Friday, as well as assuming that issuing press releases is adequate public notice in this day and age all demonstrate Mountain Home AFB’s need to call in reinforcements. Good Reporting Sir! Best in town. I have a great deal of trust and respect for our men and women in uniform. I have less respect for the top-top brass and civilians who think this stuff up and sometimes give really stupid orders. I’ve no doubt the pentagon views us as sheep. If you take offense to this point of view, please review all the times in the past 100 years when civilians were unknowingly put at risk in military experiments, testing, and training. This likely is a low risk exercise unless the folks on the ground get tangled up with Neighborhood Watch. A very real possibility. “See something say something” has created a lot of paranoid people. Just ask 911 dispatch how many completely false suspicious person calls they get each day. However, many other good questions raised and need answers. Half the aircraft based at MHAFB are owned and operated by the Singapore Air Force. A very professional group. However, is this just the foot in the door? Will they expand this to any of our friendly forces needing training? Lasers. “Eye safe” laser light reflected off an object such as a vehicle or building, and then that reflection still being detectable from many miles away, is a powerful laser. I have heard but do not have facts that “eye safe” can still damage corneas. Let’s get a straight answer from USAF medical on this. I think the term eye-safe is being used loosely, especially so if the very powerful airborne targeting lasers are used. Radars. Will they be blasting us with high definition targeting radars on the aircraft? EDITOR NOTE–Good points. If a kid with a pencil laser can cause harm to a pilot, the “eye-safe” version certainly can do harm. Also, there is nothing to prevent expansion of the program. Look at the INEL agreement to ban nuke waste and pay for violations. I am concerned that the Air Force presentation last night was full of weasel words, and spin (just like the DOPAA Scoping Document). When asked hard questions- like where has Urban CAS been taking place – evasive answers were still given with perhaps some degree of truth (perhaps) only emerging after a series of questions. Some of what we were told was false – and contradicted by the Air Force’s own documents. For example, the AF Major said there would be no increase in flights to train ranges if MORE Singapore planes are brought to Mountain Home – as is proposed in a Dec. 2017 Draft EA. Yet that EA shows there WILL be an increase in flights. I was also dismayed at how the Major downplayed the safety risks of conducting Close Air Support (CAS) training over the densest population in Idaho with particular training activity concentration over and in the heart of cities. He cited F-15 safety. Just this week, there is a news report on what caused the crash of two A-10s 50 miles from Nellis last year. It was Pilot Error, and the training being conducted was CAS. Dave brought up some very good points near the beginning of questions. He asked what military planes seen very recently were doing in Boise – a reply was they were practicing landing at the Boise Airport (I wonder what NEPA analysis covers safety concerns with this training activity over civilians?). The other question was whether the AF planned to do what the Idaho Army Guard is now doing at the Orchard Training Area in Snake River Birds of Prey. The Army Guard at Orchard is basically inviting out of state Guard units and other branches of the military to come and train and tear up the desert- to profit off of payments for Orchard use, and now they want MORE land. The AF answer to this question was No this proposal is only for MHAFB use. But of course that could change very quickly if the AF did a follow up EA or CX enabling planes from other bases (and countries) to use a million Idaho civilians and the urban “chaos” the AF claims it needs for War Game training. I’ve requested more info about Boise-area training opportunities. EDITOR NOTE–As noted regarding the Orchard Combat Training Center (OCTC) in SE Ada County, this sure looks like someone is marketing the business of war and seeks to get paid for it. Rabula: YES. I think you have hit on something. There is evidently a growing military contractor industry associated with CAS. And there is the paving and building contractor industry associated with always building more stuff at MHAFB for Singapore so that Idaho’s public lands and wildlife can be sacrificed for training disturbance from a foreign military. And now under the MHAFB Urban CAS scheme, we civilians are about to become a Training Asset of sorts. YOU can bet someone will find way to profit off us being War Game fodder. I count 13 inquiring people in the picture. How total many showed up? Were any of them under age 40? Any of them live more than 1 mile from the airport? Any of them support the F-35 in Boise? You are welcomed to use my house for a target. It is the one with a giant peace sign painted on the roof..
You are welcome to invite our allied air force pilots as well. I understand interacting with air/ground control and communication training is important for all- including those USAF operates with in theater. I don’t care if your fly-bys upset the red-wing warblers in my yard, or my dog. And I am sure your pilots are just as concerned about their lives as they are bout mine. Your ground spotters should be armed. That’s why they are called military. perhaps some people are missing the point that part of the training is for the ground crew as well. Their training is, “You must operate in this environment WITHOUT being detected or noticed”. Wearing a uniform or driving a marked mark does NOTHING for the ground controller. This isn’t science and it’s pretty easy to realize the objectives for such training, right? So it is perfectly acceptable to be in disguise– absolutely. IF someone does call 911 to report suspicious behavior, that controller has failed the training. In Syria, that controller would be dead. In Boise, 12 cops might show up (maybe just as lethal though). This training is essential – specially given our current world situation. And you all may misunderstand how those lasers work. They’re not using the same laser you use to play with your cat. If this actually happens-I would ask Katie Kite to intentionally go find those ground crews and identify the jets . It will be fun. Maybe they could give you a call-sign as the enemy spotter adversary, like “Killer Kate the Kat Lady” But don’t expect they tell you when and where they will be. If you get a photo of a confirmed spotter or a jet in training, I’ll give $100 to your favorite enviro-terrorism group. —-A lot of unnecessary worry and meddling. I truly appreciate the Guardian and commenters keeping us informed about this unsettling military activity. I don’t know how Boise is so lucky to be the setting for these war games. Maybe the jets can be used by City Hall to actually demolish historic buildings that get in the way of unrestrained development. Is it possible or probable that we the people of Boise will be used for target practice while military contractors are profiting from the exercises? This should not be allowed in the same sense that cattle should not graze public lands for free, nor drilling, nor waste storage, etc. etc. I do believe we’ve stumbled into a defense contractor’s business enterprise. It’s hiding in plain sight behind the patriotic ‘support of troops’ banner. Mr. Mayor, you could probably make enough in fees off of this new urban training range to pay for your friends to do another trolley study. Why give it away? I think Quality of Life in Boise does not exist. Most Livable City is the nickname for the marketing campaign to draw more people to Boise and Idaho. What we do have now daily is a new public meeting to announce yet another initiative with impacts on us, such as our terrible air quality, more noise, and usually higher taxes. Since Mayor Bieter is always after new tax revenues, he must be bringing these initiatives to us (from his friends). At least, I have never heard him publicly oppose any of them. Easterner: Katie Kite here. The meeting was Standing Room only in the Marion Bingham Room. 80 – 100 people is my guess – as some folks had to leave early, but others showed up at the time of the little-publicized meeting which overlapped with work and commute hours. That’s odd Katie, In THIS photo we see EMPTY chairs being unused, two in the FRONT row and plenty against the wall, and no one STANDING against the wall where there is plenty of space to ‘stand’ for a good spot. If you say so… But even a 100 would be an EXTREMELY low turn-out for Boise. A space was RESERVED for 40 despite there being an auditorium with more capacity. “Canceled Due to Lack of Interest” as my physics teacher used to say. The Marion Bingham Room- Location: Main Library – 715 S. Capitol Blvd. Capacity: 65; 40 for viewing television, slides, etc. So they set it up for 40 and there are empty chairs. = 80-100?? EDITOR NOTE–I took the picture and due to a structural support column, more than half the audience was not visible. The head count was variable as some folks came and went. Many were indeed standing. Arguing about the size of the audience is petty and not worth discussion. In Twin Falls and Glens Ferry only the mayors showed up. It would be fair to claim “80 times as many people attended in Boise .” The low turnout was due to clumsy notification by the Air Force and lack of service to the community by the legacy media. I think it’s very good for patriotic people to ask lots of probing questions of our government and its military. As great as is America, it’s not as though our government is not subject to incompetence, or even corruption. It takes a vigilant citizenry to make a democracy work, and I heartily thank the people who make the effort to attend these meetings, and seek answers that are to the benefit of us all. I always in joy reading this blog and really like it when easterner chimes in and shows why we don’t need anymore like him around the valley. 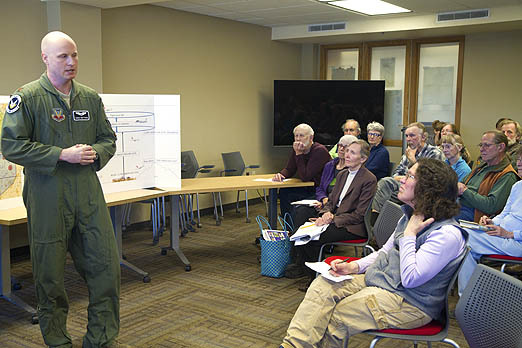 Just a quick question – did the Air Force guy at the meeting think the meeting was going to be so hot and volatile that he needed to wear the Nomex flight suit? Or did he fly in in an F-35?